Raleigh – In a panel discussion this morning at the North Carolina Free Enterprise Foundation, NC GOP Executive Director Dallas Woodhouse threatened justices on the North Carolina Supreme Court with impeachment and removal if they vote against the Republican legislature on the constitutional ballots. 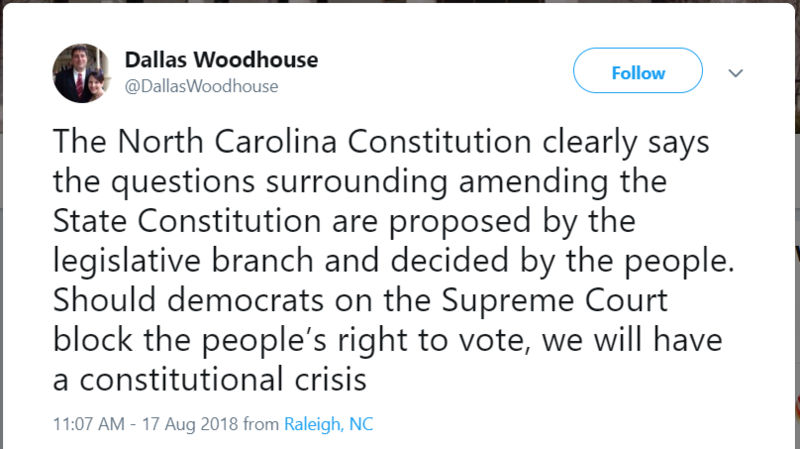 Woodhouse said that if the justices rule against the Republican legislature’s position and removes any of the amendments we’ll have a “constitutional crisis.” He then, in the next sentence, clearly stated to the room of 20-30 people the exact number of votes it takes to impeach a justice and remove a justice. The Republican Party is threatening “democrats on the Supreme Court” with impeachment and removal if they vote against the Republican legislature’s wishes. This is a clear effort from Republicans to intimidate justices on the bench into keeping their deceptive amendments on the ballot. It also raises important questions, most pressing, have Senator Berger, Speaker Moore, and legislative leaders discussed taking this step before? Jeff Tarte and Dan Forest Say They Would “Fix” The I-77 Contract. What Do They Mean?